Hey, Valentine You’re a Treasure! 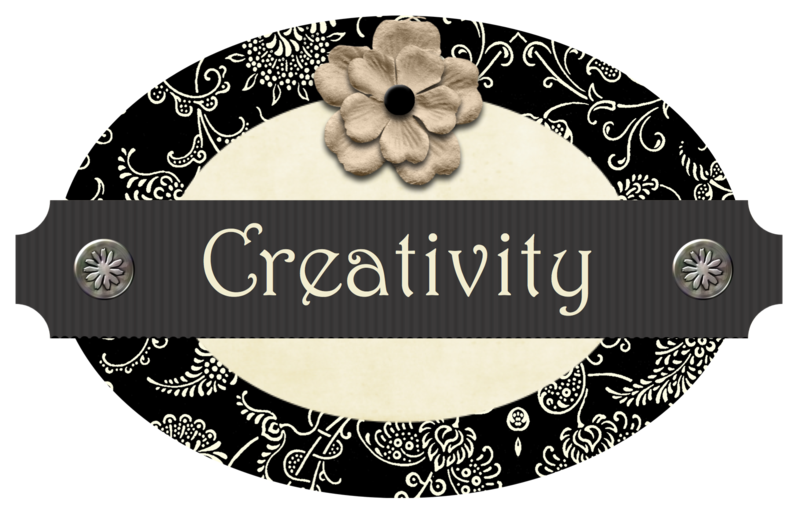 – Stampin’ Up! The first time I flipped through the Stampin’ Up! 2015 Occasions catalog, I was with my son. 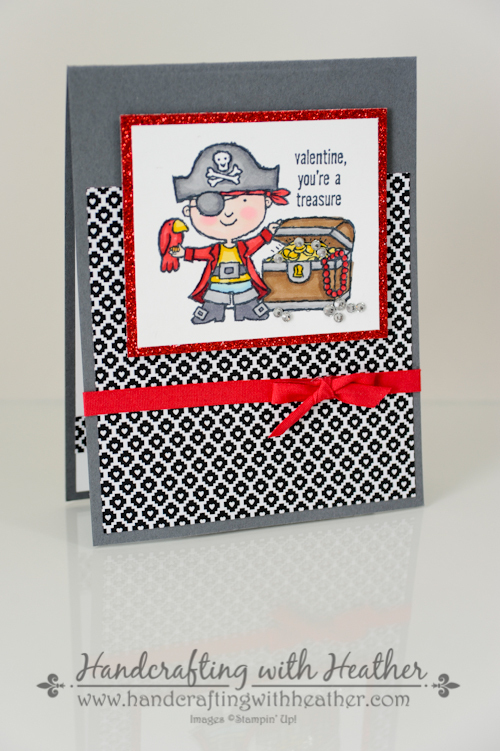 As soon as I got to the page with the Hey, Valentine stamp set on it, he said, “I want the pirate one!” I knew then that I would use that stamp for my sweet little Valentine boy! 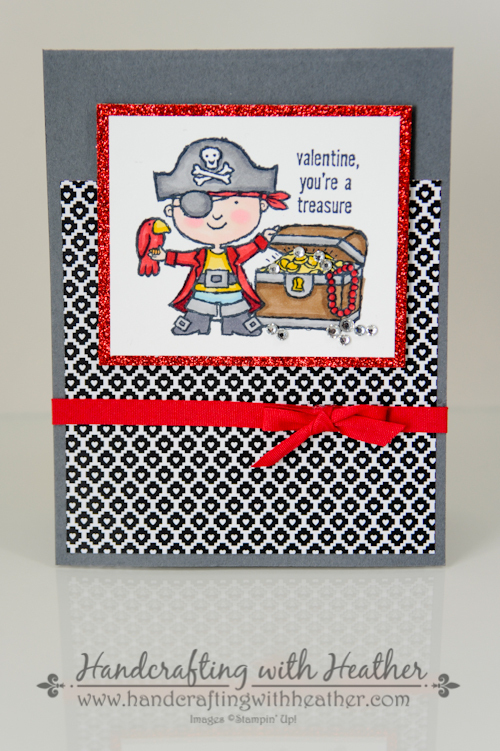 The design of this card was CASED from Angie Britt. I just loved how she colored the image and combined it with the DSP from the Stacked with Love Paper Stack. The Blendabilities markers worked perfectly for this little guy! Did you know that you can earn FREE Stampin’ Blendabilities with every $50 purchase during Sale-A-Bration through March 31, 2015. You can choose from 12 different color options! Although I stayed pretty faithful to the original card design, I did add a few little extra details to make it my own. I wanted to add a little extra pizzaz, so I mounted my image on Red Glimmer Paper, and a pirate’s booty wouldn’t be complete without diamonds… the perfect opportunity for some rhinestones, I’d say! Finally, I added some Real Red 1/4″ Cotton Ribbon to the front and a few little hearts and a strip of DSP to the inside to finish it off. 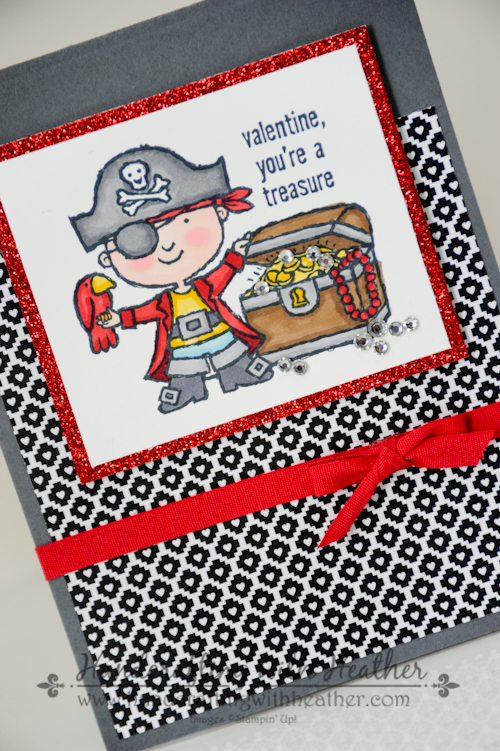 I know Carter is going to love getting this card on Valentine’s day…. now, I just have to decide what I’m going to give him to go with it! If you are a fan of this project, I hope you will pin it to Pinterest for me. You will find a “pin it” button at the very bottom of this post following the supply list.